Had breakfast with Mr. L.
Went down to the “Flandria.” They say Zele has been taken. There has been terrific anxiety here for Ursula Dearmer and the two Belgian nurses (Madame F.’s daughter and niece), who were left there all night in the convent, which may very well be in the hands of the Germans by now. An Ambulance car went off very early this morning to their rescue and has brought them back safe. We are told that the Germans are really advancing on Ghent. We have orders to prepare to leave it at a minute’s notice. This time it looks as if there might be something in it. The British troops are pouring into Ghent. There is a whole crowd of them in the Place in front of the Station. And some British wounded from Antwerp are in our Hospital. Heavy fighting at Lokeren, between Ghent and Saint Nicolas. Car 1 has been sent there with the Commandant, Ursula Dearmer, Janet McNeil and the Chaplain (Mr. Foster has been hurt in lifting a stretcher; he is out of it, poor man). Mrs. Torrence, Dr. Wilson and Mr. Riley have been sent to Nazareth. Mrs. Lambert has gone to Lokeren with her husband in his car. I was sent for this morning by somebody who desired to see the English Field Ambulance. Drawn up before the Hospital I found all that was left of a Hendon bus, in the charge of two British Red Cross volunteers in khaki and a British tar. The three were smiling in full enjoyment of the high comedy of disaster. They said they were looking for a job, and they wanted to know if our Ambulance would take them on. They were keen. They had every qualification under the sun. The bus was a thing of heroism and gorgeous ruin. The nose of its engine looked as if it had nuzzled its way through a thousand débâcles; its dark-blue sides were coated with dust and mud to the colour of an armoured car. The letters M. E. T. were barely discernible through the grey. Its windows were shattered to mere jags and spikes and splinters of glass that adhered marvellously to their frames. I don’t know how I managed to convey to the three volunteers that such a bus would be about as much use to our Field Ambulance as an old greenhouse that had come through an earthquake. It was one of the saddest things I ever had to do. Unperturbed, and still credulous of adventure, they climbed on to their bus, turned her nose round, and went, smiling, away. Who they were, and what corps they belonged to, and how they acquired that Metropolitan bus I shall never know, and do not want to know. I would far rather think of them as the heroes of some fantastic enterprise, careering in gladness and in mystery from one besieged city to another. Saw Madame F., who looks worried. She suggested that I should come back to the Hospital. She says it must be inconvenient for the Commandant not to have his secretary always at hand. At the same time, we are told that the Hospital is filling up so fast that our rooms will be wanted. And anyhow, Dr. —— has got mine. I have found an absurd little hotel, the Hôtel Cecil in the Place, opposite the Hospital, where I can have a room. Then I can be on duty all day. Went down to the “Poste.” Gave up my room, packed and took leave of the nice fat propriétaire and his wife. Driving through the town, I meet French troops pouring through the streets. There was very little cheering. Settled into the Hôtel Cecil; if it could be called settling when my things have to stay packed, in case the Germans come before the evening. The Hôtel Cecil is a thin slice of a house with three rooms on each little floor, and a staircase like a ladder. There is something very sinister about this smallness and narrowness and steepness. You say to yourself: Supposing the Germans really do come into Ghent; there will be some Uhlans among them; and the Uhlans will certainly come into the Hôtel Cecil, and they will get very drunk in the restaurant below; and you might as well be in a trap as in this den at the top of the slice up all these abominable little steep stairs. And you are very glad that your room has a balcony. But though your room has a balcony it hasn’t got a table, or any space where a table could stand. There is hardly anything in it but a big double bed and a tall hat-stand. I have never seen a room more inappropriate to a secretary and reporter. The proprietor and his wife are very amiable. He is a Red Cross man; and they have taken two refugee women into their house. They have promised faithfully that by noon there shall be a table. Noon has come; and there is no table. The cars have come back from Lokeren and Nazareth, full of wounded. Mrs. Lambert and her husband have come back from Lokeren. They drove right into the German lines to fetch two wounded. They were promptly arrested and as promptly released when their passports had shown them to be good American citizens. They brought back their two wounded. Altogether, ten or fifteen wounded have been brought back from Lokeren this morning. The Commandant has taken me out with the Ambulance for the first time. We were to go to Lokeren. On the way we came up with the Lamberts in their scouting-car. They asked me to get out of the Ambulance car and come with them. On the whole, after this morning, it looked as if the scouting-car promised better incident. So I threw in my lot with the Lamberts. It was a little disappointing, for no sooner had the Ambulance car got clean away than the scouting-car broke down. Also Mr. Lambert stated that it was not his intention to take Mrs. Lambert into the German lines again to-day if he could possibly help it. We waited for an exasperating twenty minutes while the car got righted. From our street, in a blue transparent sky, so high up that it seemed part of the transparency, we saw a Taube hanging over Ghent. People came out of their houses and watched it with interest and a kind of amiable toleration. At last we got off; and the scouting-car made such good running that we came up with our Ambulance in a small town half-way between Ghent and Lokeren. We stopped here to confer with the Belgian Army Medical officers. They told us it was impossible to go on to Lokeren. Lokeren was now in the hands of the Germans. The wounded had been brought into a small village about two miles away. When we got into the village we were told to go back at once, for the Germans were coming in. The Commandant answered that we had come to fetch the wounded and were certainly not going back without them. It seemed that there were only four wounded, and they had been taken into houses in the village. We were given five minutes to get them out and go. I suppose we stayed in that village quite three-quarters of an hour. It was one straight street of small houses, and beyond the last house about a quarter of a mile of flat road, a quiet, grey road between tall, slender trees, then the turn. And behind the turn the Germans were expected to come in from Lokeren every minute. And we had to find the houses and the wounded men. The Commandant went into the first house and came out again very quickly. The man in the room inside was dead. We went on up the village. Down that quiet road and through the village, swerving into the rough, sandy track that fringed the paved street, a battery of Belgian artillery came clattering in full retreat. The leader turned his horse violently into a side alley and plunged down it. I was close behind the battery when it turned; I could see the faces of the men. They had not that terrible look that Mr. Davidson told me he saw on the faces of Belgians in retreat from [?] Zele. There was no terror in them, only a sort of sullen annoyance and disgust. Then, through the plunging train, I caught sight of the innocent Commandant, all by himself, strolling serenely towards the open road, where beyond the bend the Germans were presumably pursuing the battery. It was terribly alarming to see the Commandant advancing to meet them, all alone, without a word of German to protect him. There were gaps in the retreat, and I dashed through one of them (as you dash through the traffic in the Strand when you’re in a hurry) and went after the Commandant with the brilliant idea of defending him with a volley of bad German hurled at the enemy’s head. And the Commandant went on, indifferent both to his danger and to his salvation, and disappeared down a little lane and into a house where a wounded man was. I stood at the end of the lane with the sublime intention of guarding it. The Commandant came out presently. He looked as if he were steeped in a large, vague leisure, and he asked me to go and find Mr. Lambert and his scouting-car. Mr. Lambert had got to go to Lokeren to fetch some wounded. So I ran back down the village and found Mr. Lambert and his car at the other end of it. He accepted his destiny with a beautiful transatlantic calm and dashed off to Lokeren. I do not think he took his wife with him this time. I went back to see if the Germans had got any nearer to the Commandant. They hadn’t. What with dressings and bandages and looking for wounded, the Ambulance must have worked for about half an hour, and not any Germans had turned the corner yet. It was still busy getting its load safely stowed away. Nothing for the wretched Secretary to do but to stand there at the far end of the village, looking up the road to Lokeren. There was a most singular fascination about the turn of that road beyond the trees. Suddenly, at what seemed the last minute of safety, two Belgian stretcher-bearers, without a stretcher, rushed up to me. They said there was a man badly wounded in some house somewhere up the road. I found a stretcher and went off with them to look for him. We went on and on up the road. It couldn’t have been more than a few hundred yards, really, if as much; but it felt like going on and on; it seemed impossible to find that house. There was something odd about that short stretch of grey road and the tall trees at the end of it and the turn. These things appeared in a queer, vivid stillness, as if they were not there on their own account, but stood in witness to some superior reality. Through them you were somehow assured of Reality with a most singular and overpowering certainty. You were aware of the possibility of an ensuing agony and horror as of something unreal and transitory that would break through the peace of it in a merely episodical manner. Whatever happened to come round the turn of the road would simply not matter. And with your own quick movements up the road there came that steadily mounting thrill which is not excitement, or anything in the least like excitement, because of its extreme quietness. This thrill is apt to cheat you by stopping short of the ecstasy it seems to promise. But this time it didn’t stop short; it became more and more steady and more and more quiet in the swing of its vibration; it became ecstasy; it became intense happiness. It lasted till we reached the little plantation by the roadside. While it lasted you had the sense of touching Reality at its highest point in a secure and effortless consummation; so far were you from being strung up to any pitch. Behind the plantation, on a railway siding, a train came up from Lokeren with yet another load of wounded. And in the train there was confusion and agitation and fear. Belgian Red Cross men hung out by the doors of the train and clamoured excitedly for stretchers. There was only one stretcher, the one we had brought from the village. Somebody tried to grab our one stretcher. The two bearers seemed inclined to give it up. Nobody knew where our badly wounded man was. Nobody seemed very eager now to go and look for him. We three were surrounded and ordered to give up our stretcher. No use wasting time in hunting for one man, with the Germans on our backs. None of the men we were helping out of the train were seriously hurt. I had to choose between my one badly wounded man, whom we hadn’t found, and about a dozen who could stumble somehow into safety. But my two stretcher-bearers were wavering badly, and it was all I could do to keep them firmly to their job. Then three women came out of a little house half hidden by the plantation. They spoke low, for fear the Germans should overhear them. The stretcher-bearers hurried off with their stretcher. The train unloaded itself somehow. The man, horribly hurt, with a wound like a red pit below his shoulder-blades, was brought out and laid on the stretcher. He lay there, quietly, on his side, in a posture of utter resignation to anguish. He was a Flamand, clumsily built; he had a broad, rather ugly face, narrowing suddenly as the fringe of his whiskers became a little straggling beard. But to me he was the most beautiful thing I have ever seen. And I loved him. I do not think it is possible to love, to adore any creature more than I loved and adored that clumsy, ugly Flamand. He was my first wounded man. For I tried, I still try, to persuade myself that if I hadn’t bullied my two bearers and repulsed the attack on my stretcher, he would have been left behind in the little house in the plantation. We got him out of the plantation all right and on to the paved road. Ursula Dearmer at Termonde with her Belgian officer, and at Zele with all her wounded, couldn’t have been happier than I was with my one Flamand. We got him a few yards down the road all right. Then, to my horror, the bearers dumped him down on the paving-stones. They said he was much too heavy. They couldn’t possibly carry him any more unless they rested. I didn’t think it was exactly the moment for resting, and I told them so. The Germans hadn’t come round the turn, and probably never would come; still, you never know; and the general impression seemed to be that they were about due. But the bearers stood stolidly in the middle of the road and mopped their faces and puffed. The situation began to feel as absurd and as terrible as a nightmare. So I grabbed one end of the stretcher and said I’d carry it myself. I said I wasn’t very strong, and perhaps I couldn’t carry it, but anyhow I’d try. They picked it up at once then, and went off at a good swinging trot over the paving-stones that jolted my poor Flamand most horribly. I told them to go on the smooth track at the side. They hailed this suggestion as a most brilliant and original idea. As the Flamand was brought into the village, the Ambulance had got its wounded in, and was ready to go. But he had to have his wound dressed. He lay there on his stretcher in the middle of the village street, my beloved Flamand, stripped to the waist, with the great red pit of his wound yawning in his white flesh. I had to look on while the Commandant stuffed it with antiseptic gauze. I had always supposed that the dressing of a wound was a cautious and delicate process. But it isn’t. There is a certain casual audacity about it. The Commandant’s hands worked rapidly as he rammed cyanide gauze into the red pit. It looked as if he were stuffing an old crate with straw. And it was all over in a moment. There seemed something indecent in the haste with which my Flamand was disposed of. I rather hoped that we were going to wait till the men I had left behind in the plantation had come up. But the car was fairly full, and Ursula Dearmer and Janet and Mrs. Lambert were told off to take it in to Z——, leave the wounded there and come back for the rest. I was to walk to Z—— and wait there for the returning car. Nothing would have pleased me better, but the distance was farther than the Commandant realized, farther, perhaps, than was desirable in the circumstances, so I was ordered to get on the car and come back with it. We got away long before the Germans turned the corner, if they ever did turn it. In Z——, which is half-way between Lokeren and Ghent, we came upon six or seven fine military ambulances, all huddled together as if they sought safety in companionship (why none of them had been sent up to our village I can’t imagine). Ursula Dearmer, with admirable presence of mind, commandeered one of these and went back with it to the village, so that we could take our load of wounded into Ghent. We did this, and went back at once. The return journey was a tame affair. Before we got to Z—— we met the Commandant and the Chaplain and two refugees, in Mr. Lambert’s scouting-car, towed by a motor-wagon. It had broken down on the way from Lokeren. We took them on board and turned back to Ghent. The wounded came on in Ursula Dearmer’s military car. 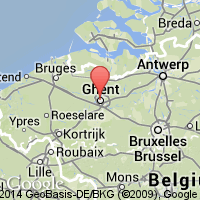 Twenty-three wounded in all were taken from Lokeren or near it to-day. Hundreds had to be left behind in the German lines. We have heard that Antwerp is burning; that the Government is removed to Ostend; that all the English have left. One of them is a young British officer, Mr. ——. He is said to be mortally wounded. Dr. Haynes and Dr. Bird have not gone. They and Dr. —— have joined the surgical staff of the Hospital, and are working in the operating theatre all day. They have got enough to do now in all conscience. All night there has been a sound of the firing of machine guns [?]. At first it was like the barking, of all the dogs in Belgium. I thought it was the dogs of Belgium, till I discovered a deadly rhythm and precision in the barking. Posted on October 8, 2014 December 26, 2014 by aurevoirbelleepoque	This entry was posted in Diary, May_Sinclair. Bookmark the permalink.